Starting in fall 2014, the US Department of Agriculture (USDA) interim rule on competitive foods, SMART SNACKS in Schools, goes into effect. In my opinion, there’s lots of good news in the rule, starting with more fruits, veggies, low-fat dairy foods, whole grains, and lean proteins. Based on experience with existing standards, like the 6,640+ HealthierUS School Challenge (HUSSC) winners and Alliance for a Healthier Generation (AHG) districts, the proposed rule is realistic and can benefit kids’ health. We also need a reality check about the rule does and does not do. 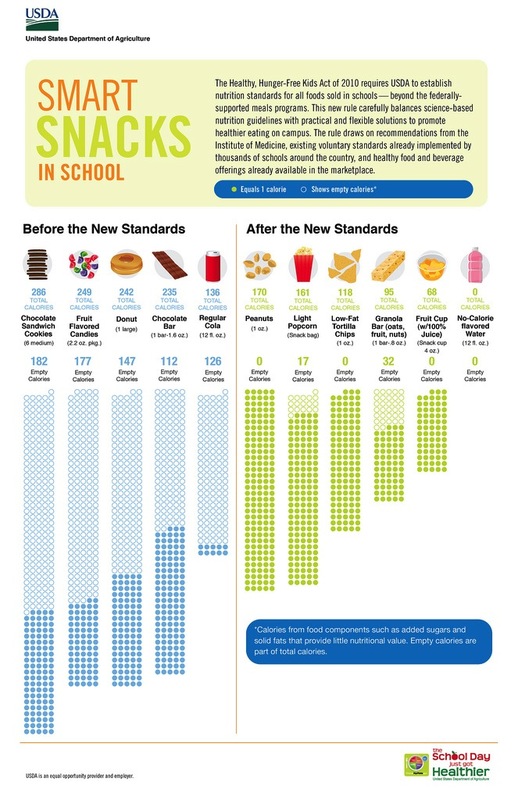 While SMART SNACKS in Schools represents another significant step toward healthy school nutrition environments, it does not cover foods brought from home, foods for classroom parties or any foods sold after regular school hours (athletic events, after-school fundraisers, etc.). Compliance and monitoring will be an issue outside of cafeterias. Fortunately, the AASA (American Association of School Superintendents) has a Competitive Foods Policy Initiative to build necessary support for strong policies. After the 2012 Nutrition Standards for School Lunch went into effect, Jane Brody wrote “There’s Homework to Do on School Lunches” in the New York Times. Her basic premise was that the federal regulations and standards are just the beginning – and that homes and schools also have work at improving how children eat. I believe the same is true for this issue. To build strong bodies and smart brains, children also need SMART SNACKS at home, SMART SNACKS brought from home to school, and SMART SNACKS served in concession stands at sporting events. A healthy school environment will take more than new regulations – it will require a culture of wellness – designed to support the connection between nutrition and academic success. On February 1, 2013, the US Department of Agriculture (USDA) announced the long-anticipated proposed rule on competitive foods in schools, now known as Smart Snacks in Schools. Published in the Federal Register on February 8th, the rule is now open for a mandatory 60-day public comment period, which closes on April 9, 2013. The overall reaction has been positive, although many folks are probably still trying to digest the details of the 160-page document. If your schedule does not permit a long read, several good summaries are available online. There is a very readable Q-and-A format in USDA Summary, excellent materials from a webinar by USDA and Food Research Action Center (FRAC), and the School Nutrition Association page with links and member-only comment section. The more you read, the more you’ll know. What follows is my personal, big picture reaction to the proposal and what it will really mean in local schools. USDA proposed an extended implementation timeline and invited comments on several options rather than outlining a single course of action. Based on experience with existing standards, especially the 5,000+ HealthierUS School Challenge (HUSSC) winners and Alliance for a Healthier Generation (AHG) districts, the proposed rule is realistic and can benefit kids’ health. 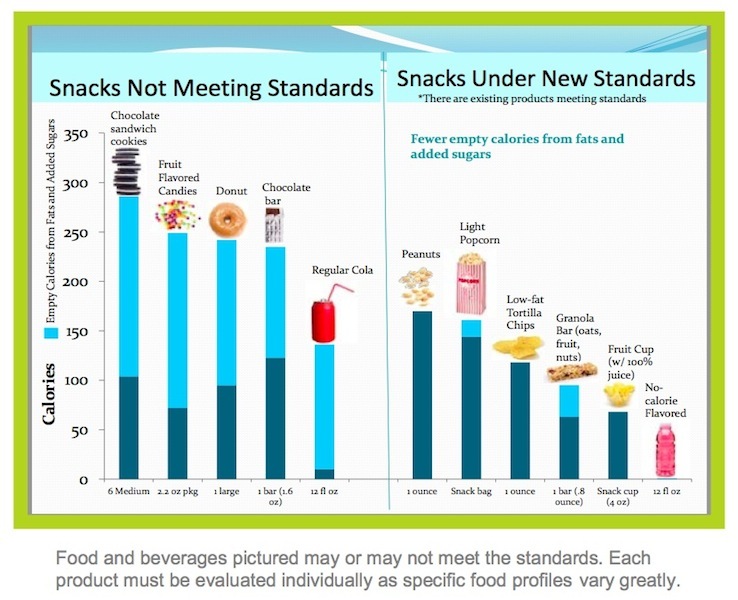 While Smart Snacks in Schools represents another significant step toward creating healthy school nutrition environments, it’s also important to note what it does not do. It does not cover foods brought from home, foods for classroom parties or any foods sold after regular school hours (athletic events, after-school fundraisers, etc.). In fact, most of the effect from this rule will be seen in cafeteria a la carte lines, as well as on some vending and fundraisers held during school hours. Compliance and monitoring will an issue outside of cafeterias; school nutrition programs know how to do the required record keeping, but it is not clear who can – or even wants to – be effective as “food police” in the wider school campus. Last October, after the 2012 Nutrition Standards for School Lunch went into effect, Jane Brody wrote “There’s Homework to Do on School Lunches” in the New York Times. Her basic premise was that the federal regulations and standards are just the beginning – and that homes and schools also have work at improving how children eat. I believe the same is true for this issue. Support a culture of wellness in your local district, for example, by serving a School Health Advisory Council (SHAC) or helping with a HUSSC application. Make smart snacks about fun and great taste for kids. Make smart snacks about fitness and sports success for coaches, athletes and boosters clubs. Make smart snacks about learning and behavior for classroom teachers and administrators. Make smart snacks about successful fundraisers that make money for clubs and organizations. Make smart snacks the cool thing to do at school rather than something that the government is making us do!! Schools are doing truly incredible things to serve local, fresh – and yes, organic – foods that kids love to eat. To see super salad bars, hyper-local apples (grown five miles from school! ), and a lunch with Sautéd Cabbage that students devoured, please visit School Meals That Rock on Facebook. This gorgeous tray from the award-winning Portland (OR) Public Schools is just a tiny taste of the delicious school feast that you can see there. Everything on this tray in OREGON GROWN – and the pear is ORGANIC!! Please take a tour School Meals That Rock and see the amazing food that is loving prepared and served by America’s School Nutrition HEROES!! 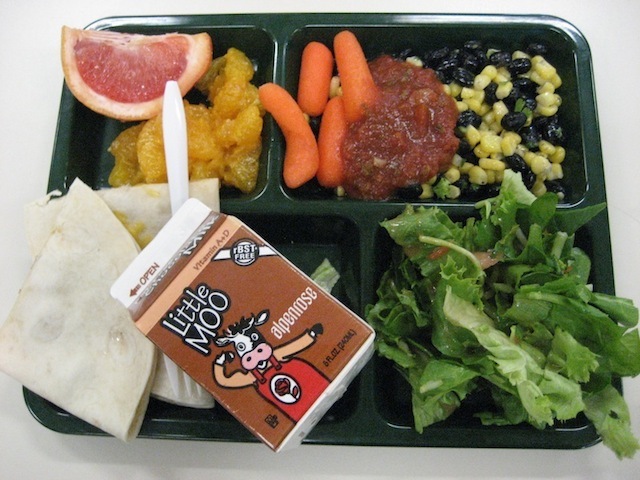 There’s been lots of talk recently about how The School Day Just Got Healthier with USDA’s Nutrition Standards in the National School Lunch and School Breakfast Programs that went into effect on July 1, 2012. Media stories abound with a generally positive tone – although many reporters wonder if students will actually eat the healthier options. I wrote about the new guidelines right here on August 24 in USDA New-trition Guidelines for School Meals: Business as usual – and a whole new ballgame. Fortunately for students, teachers, families, farmers and ranchers, some of the best news in school nutrition has nothing to do with the regulations! Incredibly positive things are happening in kitchens, cafeterias, and schoolyards from coast-to-coast – thanks to dedicated and visionary school nutrition heroes. Sometimes they make the headlines, but often as not, they labor quietly in their districts without attracting much fanfare or hoopla. 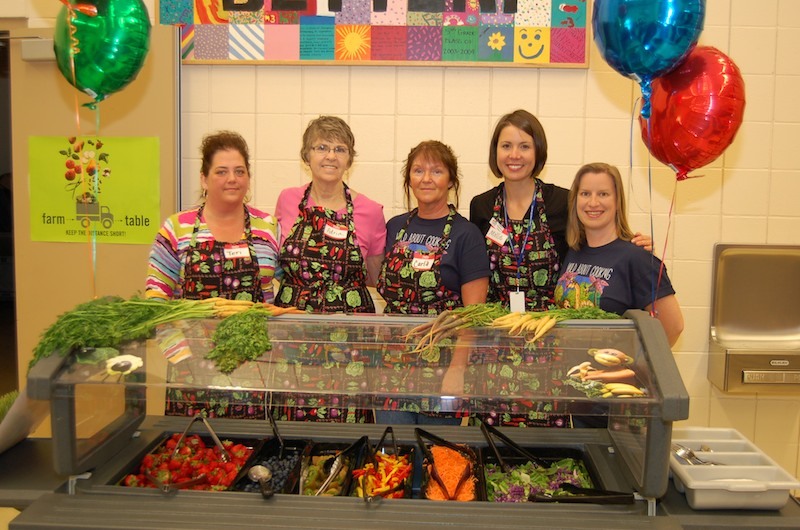 Here’s a taste of truly delicious news from four districts on the frontiers of school nutrition excellence. Literally spread from coast-to-coast, these districts are focused on serving the freshest, best tasting meals to students in the most positive, pleasant atmosphere possible. This is what we need — to get nutrient-rich food into kids; it is only nutrition WHEN they eat or drink it! In some areas, school gardens are becoming almost the norm. New Jersey could be called the “School Garden State” with more than 242 schools growing vegetables and fruits for nutrition and/or education. Denver Public Schools Food and Nutrition Services, with support from urban agricultural groups, has taken school gardening to a whole new level. 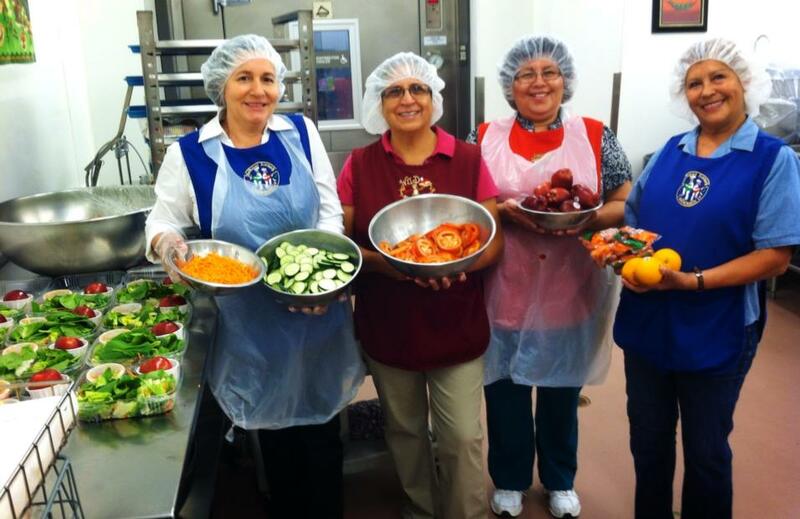 As recently announced on their Facebook page: “I am extremely proud to announce our 2012 Garden To Cafeteria schools! DPS Food and Nutrition Services will be purchasing produce from the 21 school gardens listed. Your students will then see that produce in their lunchroom salad bars! “ Now that is hyper-local! Thanks to First Lady Michelle Obama’s Let’s Move! 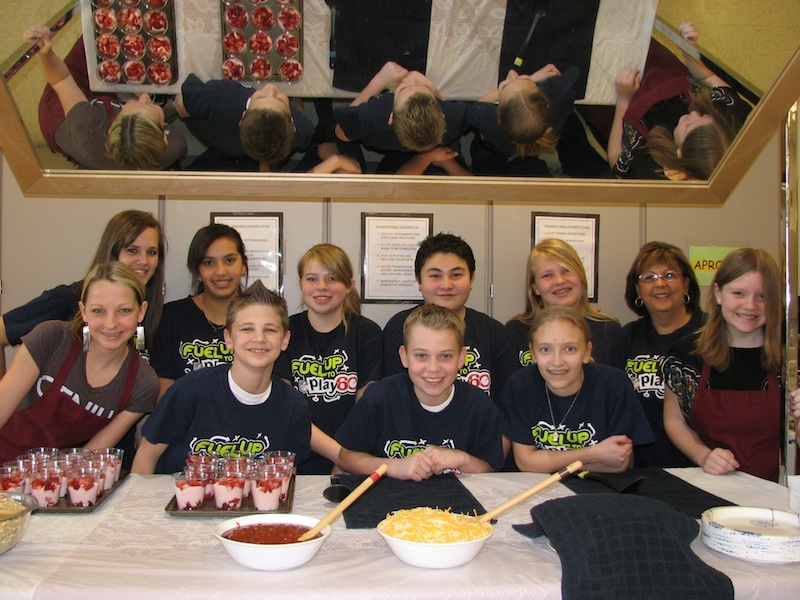 Initiative, Chefs Move to Schools, founded in May 2010, has meant a real upgrade in the culinary skills of school nutrition professionals. Chefs provide culinary boot camps for school cooks in several states and encourage “junior chefs” through many school assembly programs, like the one with Chef Virginia Willis in Marietta, Georgia. 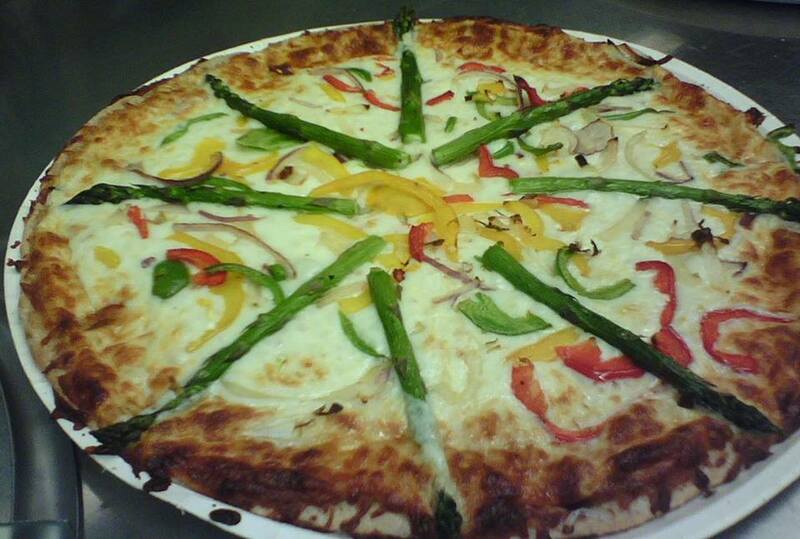 In Maplewood Richmond Heights School District (MO), Chef Robert Rusan has truly set a higher bar for school food. It’s hard to describe the comprehensiveness of the MRHS Healthy Foods program in a short paragraph. Just imagine a school nutrition program that makes its own fresh mozzarella cheese, builds an outdoor pizza oven, and harvests aqua-ponic lettuce. While all the schools described so far involved students to some degree, Slater Jr. High School in Pawtucket, Rhode Island and Foodservice Director Solange Morrisette, have kicked it up a notch with their Fruit and Vegetable Ambassador program. 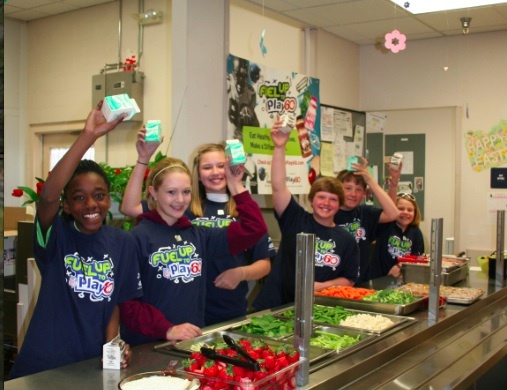 According to the USDA blog post, “the students came up with several fun ways to get their peers excited about eating fruits and vegetables. These ideas included the fruit and veggie taste testing, a fruit and veggie eating contest, a cafeteria remodel, and creating rap songs about healthy eating.” In this photo, guest farmer Shelly Pezza taught the future ambassadors about the benefits of eating local produce – which will soon show up on their salad bars. Dayle Hayes, MS, RD (Registered Dietitian), is Past-Chair of the School Nutrition Services Dietetic Practice Group (DPG) of the Academy of Nutrition and Dietetics. She helps agencies and organizations create healthier school environments across the country. You can follow her onFacebook and Twitter, and read in-depth analysis of school issues on her blog School Meals That Rock. 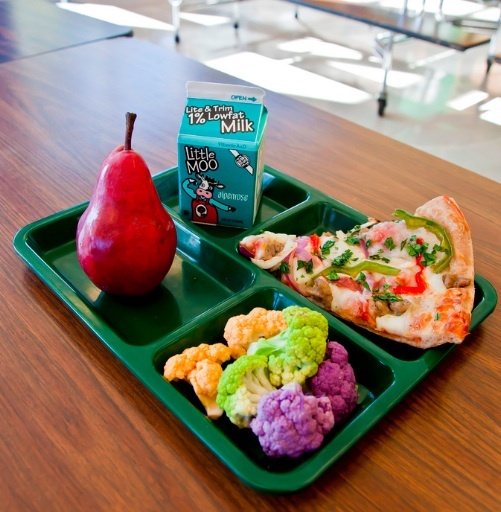 As students head back-to-school meals in cafeterias across the nation, the new standards are generating lots of media buzz with headlines like Schools scrambling to serve up healthier lunch choices, More vegetables, higher prices coming to school cafeteria lunch lines this fall, and Some Cocke County students finding new school lunches hard to swallow. From these news stories, it’s clear that the new guidelines are, sadly, a new whole ballgame for some districts. 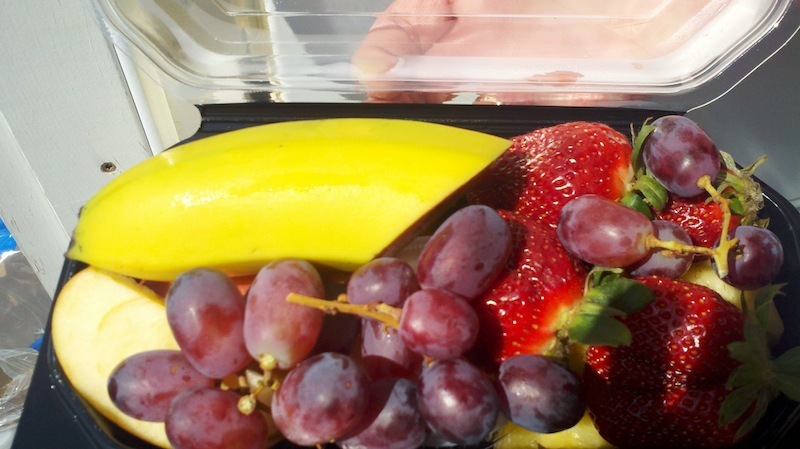 Students must now be offered a fresh, frozen, dried, or canned (in juice) fruit for lunch. 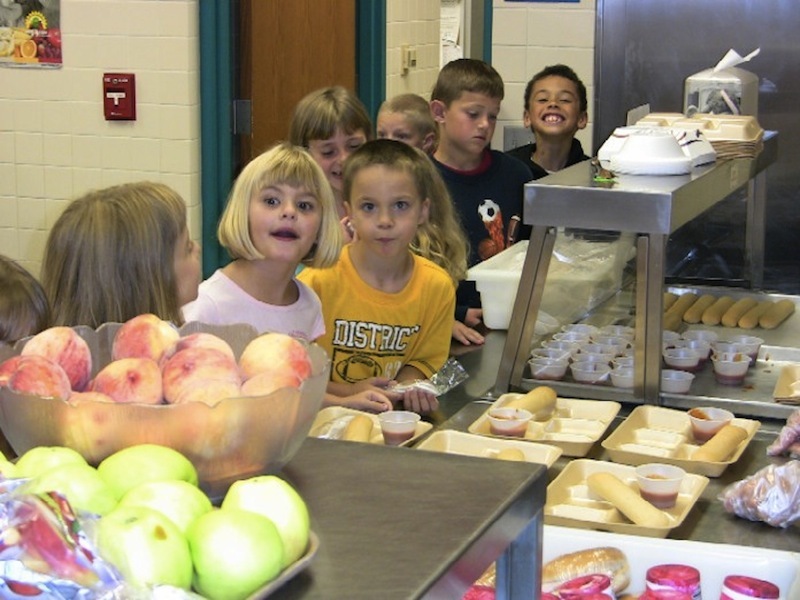 In the Montague, Michigan, School Food Service Department, they serve fruit choices daily on the lunch line. Michigan apples are so popular that Montague set a 2011 Guinness World Record for eating 9,329 apples at the same time. As per the new standards, at least half of all grains served in school lunch must now be whole grain rich (starting in 2014 all grain products must be whole grain rich). 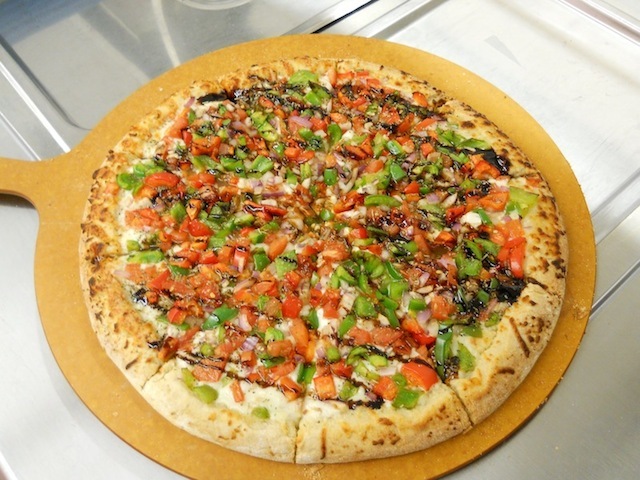 In Douglas County Schools, Colorado, they made popular pizza smarter with a whole grain crust, roasted vegetables, and a balsamic glaze (chosen by a high school student panel). Under new USDA guidance, schools must offer two varieties of milk: unflavored milk can be non-fat or 1%, while flavored milk must be non-fat. This milk policy has been the standard in Portland (Oregon) Public Schools Nutrition Services for more than a decade. As you can see, they also offer a colorful selection of produce!